Authorities from Latin American civil registries and companies in the sector gathered in Panama to exchange their experiences in civil registration and personal identification, promote support between institutions and catch up with the newest technologies in the market. This gathering, titled “Identification in Regional Migration: a Latin American Challenge”, was held November 19th to 21st in Panama City, and took place within the annual meeting of the Latin American and Caribbean Council of Civil Registries, Identity and Vital Statistics (Clarciev). Clarciev is an organism that gathers Latin American civil registry institutions, with the purpose of proving a space for the exchange of experiences in people registration and identification, and to encourage the sharing of support between institutions for their mutual benefit. 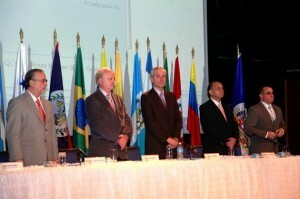 The organization of this event, which has the profile of a technology fair, also included the participation of Panama’s Electoral Court and the Organization of American States (OAS) through the Universal Civil Identity Project of the Americas (PUICA), in the Department of Effective Public Management. Panama’s Minister of the Presidency, Álvaro Alemán, was present in the event. Civil registration is of fundamental importance in a society, since it contributes to the recognition of its citizens’ rights and duties. Additionally, it is the responsibility of every state to keep their citizens’ documentation in good order. One of the ways that several governments have found to provide a better record-keeping service is the digitization of their records. This is clear example of the growing use of e-governance; this is, the use of technology in internal government processes and in the delivery of its services. For the Clarciev, it is vital to organize this event each year. The Council was born with the idea of strengthening civil registration institutions in Latin America and the Caribbean to support development in the region. According to their directives, civil identity is a fundamental right for every person. They also stated that when nations have a properly registered population, democratic governance is consolidated, given that it becomes easier to enforce political rights. Smartmatic was present and showcased its technology, services, project methodology and long experience executing civil and electoral biometric registration projects.